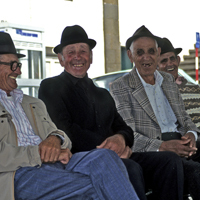 Last month Dad (90) and his buddies (85-92) started a Laugh group. They get together every morning and just laugh hilariously for a few minutes. My wife thinks they’re crazy and need help. Is she right? A growing body of research suggests a few minutes of hearty laughter can help decrease blood pressure, reduce stress hormones, alleviate pain, boost the immune function, and trigger the release of Endorphins that produce a general sense of well-being. So if Dad’s crazy, he’s crazy like a fox.